"The photograph shows the entrance to the quadrangle from the cloisters of Westminster Abbey. 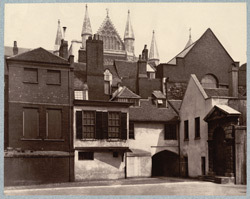 The arched doorway on the right, surmounted by a pediment, is the entrance to Westminster School. A portion of the east wing of Asburnham House is to be seen on the left. It would be difficult to find a more picturesque corner. By wonderful gradations, resembling more the results of growth than of design, gables and roofs rise one above another till they culminate in the pinnacles of the South Transept of the Abbey, and the polygonal roof of the Chapter House."